Tis the Season to be “Thai”? With the holiday season about to kick off, pumpkin, peppermint, gingerbread and eggnog are the obvious expectations. So Panera recently launched their Roasted Turkey and Cranberry Panini. Sounds like a good combination to get us ready for Thanksgiving and the holidays. But what about the customers looking for new flavor profiles? On the menu is a Thai Chopped Salad – All-natural, antibiotic-free chicken, romaine, Thai cashews, fire-roasted edamame, red peppers, carrots, fresh cilantro & wonton strips all tossed in low-fat Thai Chili Vinaigrette and drizzled with peanut sauce. For customers who want a more portable option, you can find it in the new Thai Flatbread Sandwich. Leveraging the flavors, sauces and ingredients of the Thai Chopped Salad, Panera has created the new flatbread to be more portable. This option is a nice extension to the salad and provides a broader ethnic product. But do consumers want Thai options today? 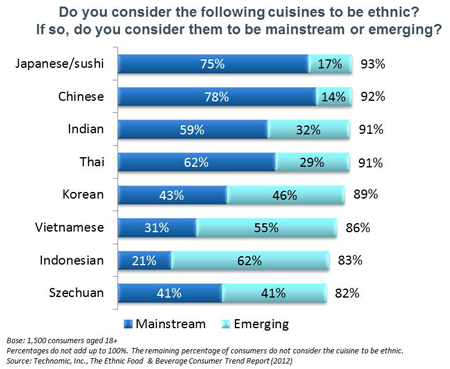 Although consumers generally see Japanese and Chinese as mainstream ethnic Asian flavors, Indian and Thai are considered by consumers as being in the upper threshold of Ethnic. Over 90 percent of consumers polled in Technomic’s recent Ethnic Food & Beverage Consumer Trend Report indicated Thai to be Ethnic. More importantly, 62 percent of those felt it was a mainstream ethnic cuisine with an additional 29 percent categorizing the cuisine to be emerging. Demand for this cuisine and flavor appear very high on the consumers appeal and creating an ethnic flavor combination on a more familiar sandwich, salad or dish can drive sales and customer creaveability! And has the industry responded to greater appeal and desire on the part of consumers? Yes, menu incidence of the term “Thai” has increased consistently each year within Technomic’s MenuMonitor online program tracking over 1,000 menus in the US with a focus on chain, independent and innovative regional growth concepts. Incidence has increased nearly 38 percent since 2009. Like many others, Panera Bread seems to be part this trend and has found an effective way to integrate the term and the flavor into their menu providing customers with greater options while staying true to their brand. This entry was posted on Wednesday, October 10th, 2012 at 8:30 am and is filed under Asian, Flavor, Food, Ingredient, Lunch/Dinner, Menu, New Product Tests/Mentions, Restaurant Segments & Cuisine, Thai, Uncategorized. You can follow any responses to this entry through the RSS 2.0 feed. You can leave a response, or trackback from your own site.